Home automation is, simply put, the Internet of Things in your home. It involves controlling all the electronic devices in your home via a single interface, including lighting, shading, climate, media and security. Hunting for the right remote is no more needed. A single application on an Apple or Android smartphone works as a centralized interface. 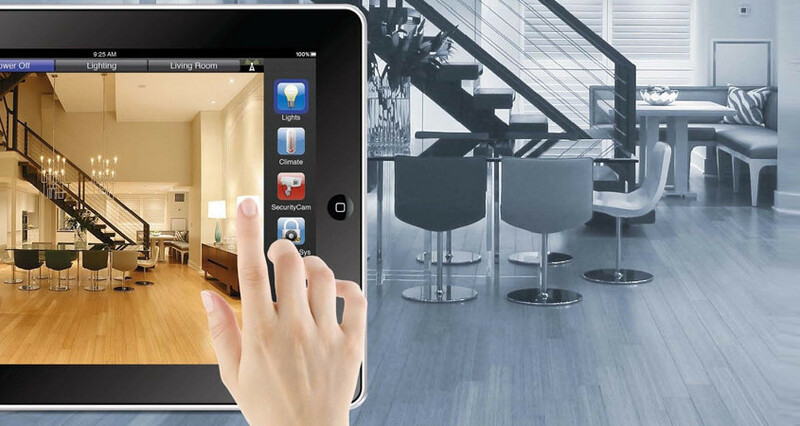 Programmed scenes, activated through the smartphone application, set up all your connected appliances as per your need. Remote functionality & an internet connection allow you to access, control & monitor your home in real time from anywhere in the world. We design completely customized automation systems in consultation with our clients. A basic system is one that would control just lighting, shades & fans via an on-wall keypad and/ or a smartphone app. A full-fledged system would allow control, monitoring & scheduling of lights, shades, fans, climate, speakers, televisions & security. Designing the system takes into account factors such as client preferences, budget, home size & appliances to be controlled. Thanks to continuous technological innovation, we can now help you seamlessly & reliably control everything – from lights, fans, air conditioners & security cameras to speakers, televisions, set-top boxes, Blu-ray players etc.